I got such information through SNS. At the same time I suddenly remember that I have told myself that I wish to skydive in 15 years ago. 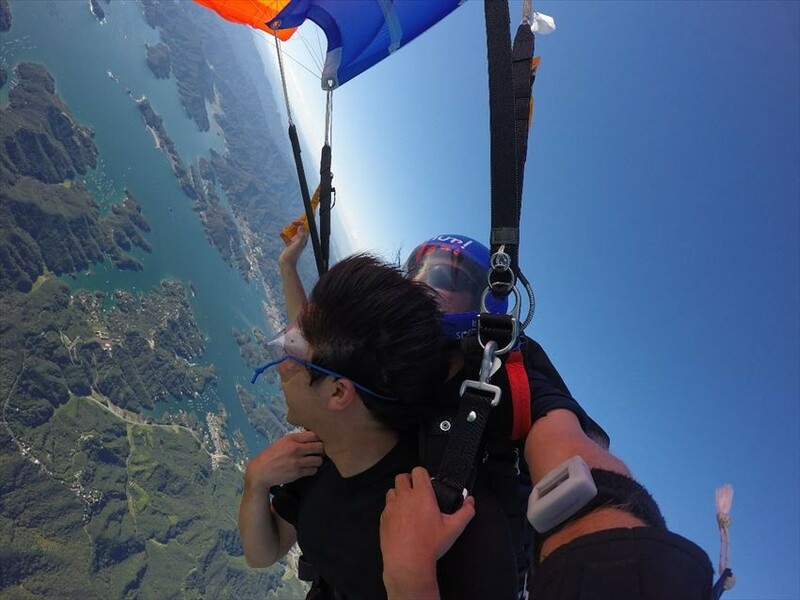 Even though the memory is a little blur, I remember that when I was a secondary school student at Toba, I heard that there is a limited time skydiving program and I was applied for it immediately. 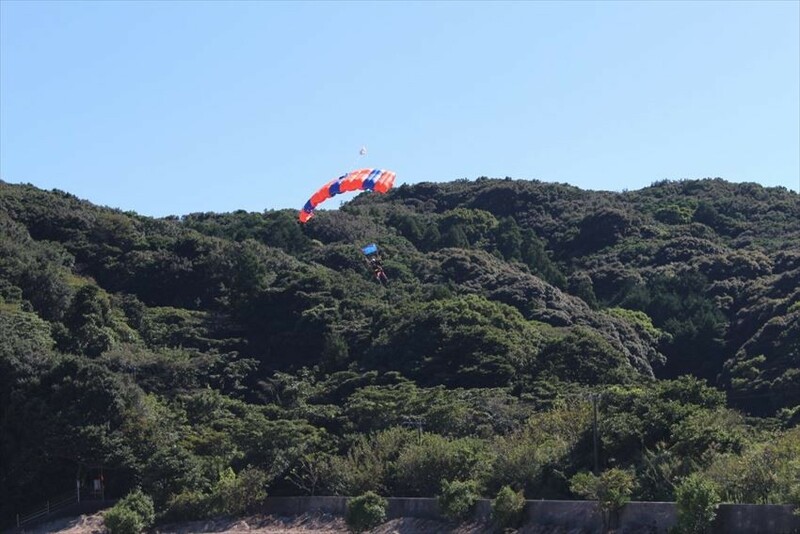 However, the feedback to me was "Secondary school students cannot skydive", and it was such a bitter memory for me. (I was later knew that I can skydive if is agreed by my guardian· · · Oh I think my mother had cheated me!). For me, if there is a nearby place where I can try skydiving, I would definitely need to try it!) 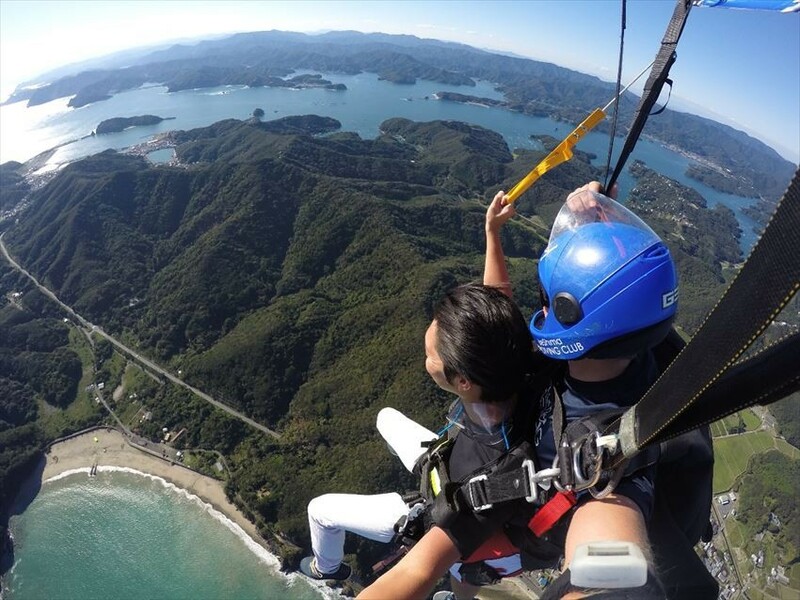 I courage myself to Ise Shima skydiving. The day we reserved was blessed with the nice weather. It seems that they were sending me yell for my first skydiving. The meeting place was at Tasoshirahama Coast. 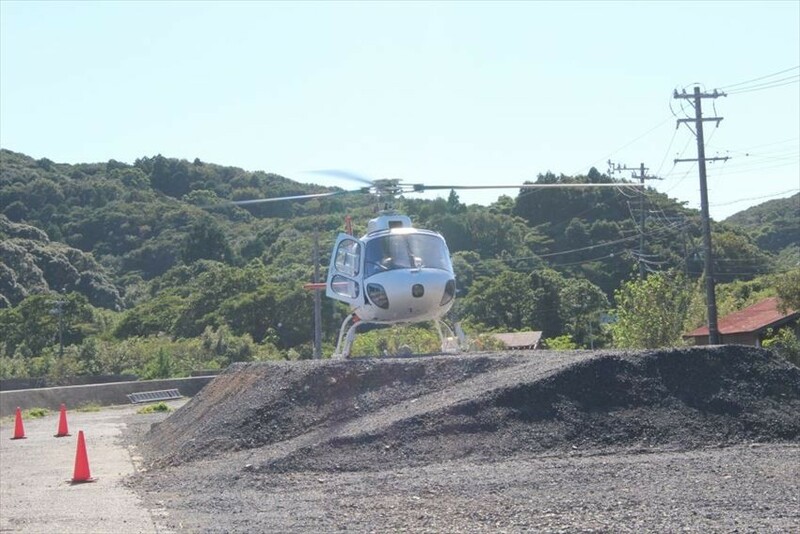 When I arrived I could see that the helicopter already on standby mode and was ready to fly. On that day, there were total 4 of us including me to participate in this skydiving experience program. 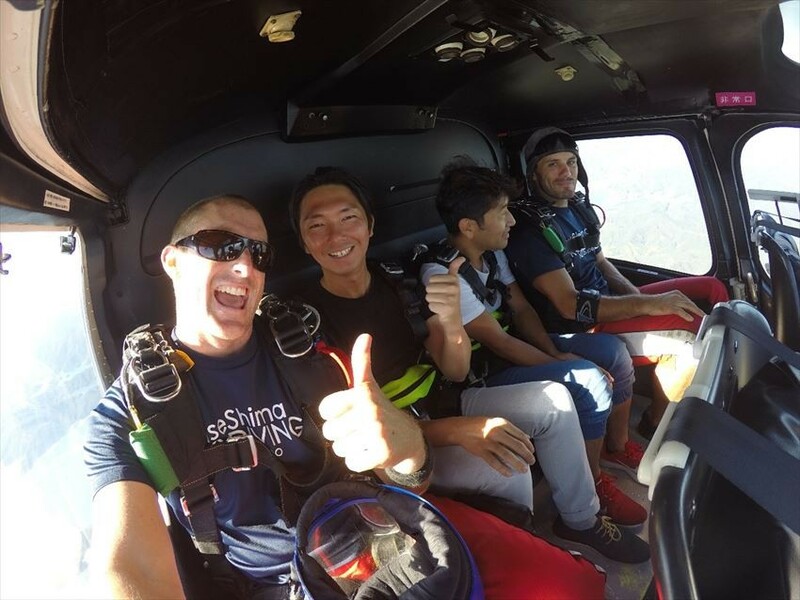 Since this time was skydive experience program, I will be tutored and led by a tough instructor from New Zealand and I guess this would be a tandem jump for me. 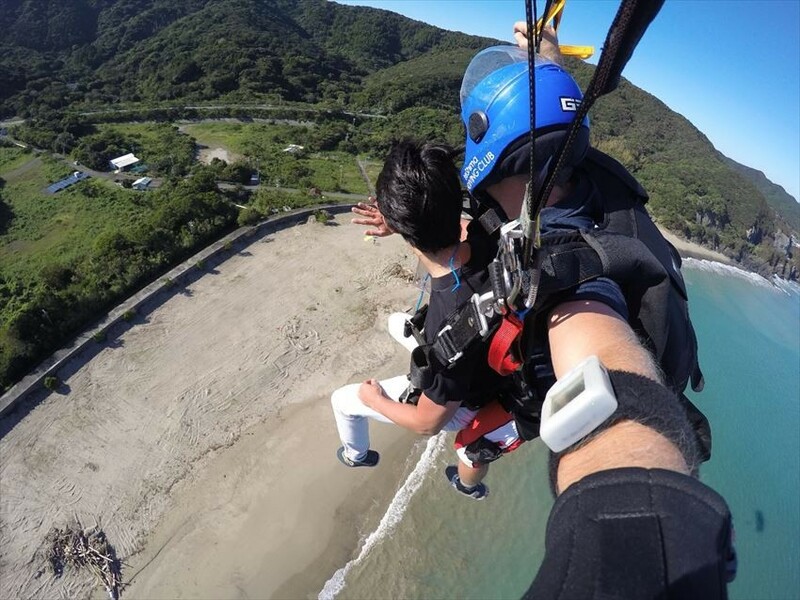 There are 5 places in Japan where you can experience skydive in Japan, and among them Ise Shima sky diving is attractive with the charm of ocean view. 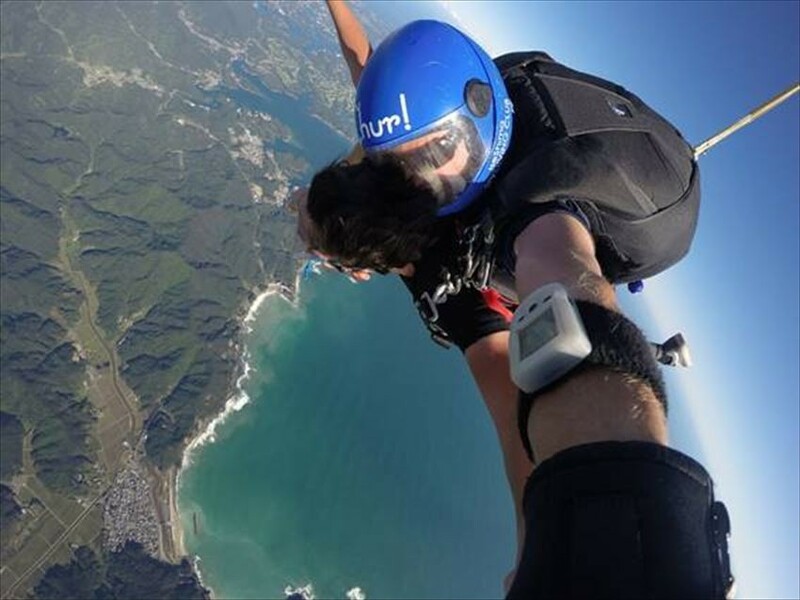 It is the only place that you could jump off near the beach side. From here you can view the scene of Ago Bay, Rias Coast, Mt. Fuji, Chita Peninsula, Nagoya area until Kii Peninsula. So now, T and K were going to depart to take helicopter in front of me. Their posture which walking towards helicopter are somehow look so cool for me. After a while, the helicopter became only a small dot in the sky when it flying high. 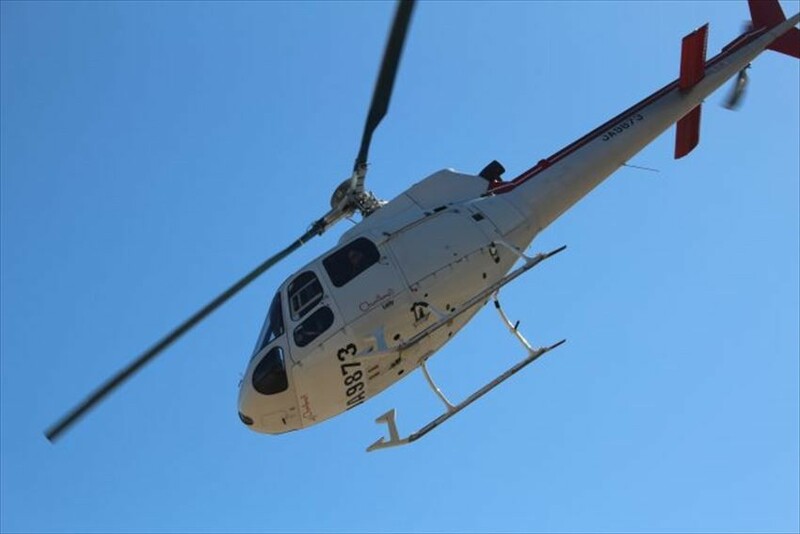 The helicopter was turning the rotor and flying up to 10,000 feet altitude (about 3,000 m). "They are going to jump soon! A parachute will open soon." The staff told us. I tried to focus and find where it is. Oh, a red parachute has opened! 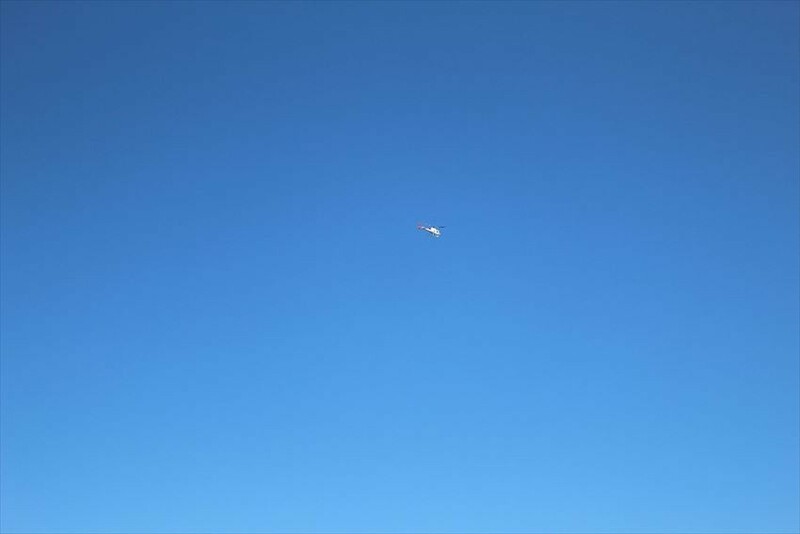 The parachute opened at about 5,000 feet height(about 1,500 m). 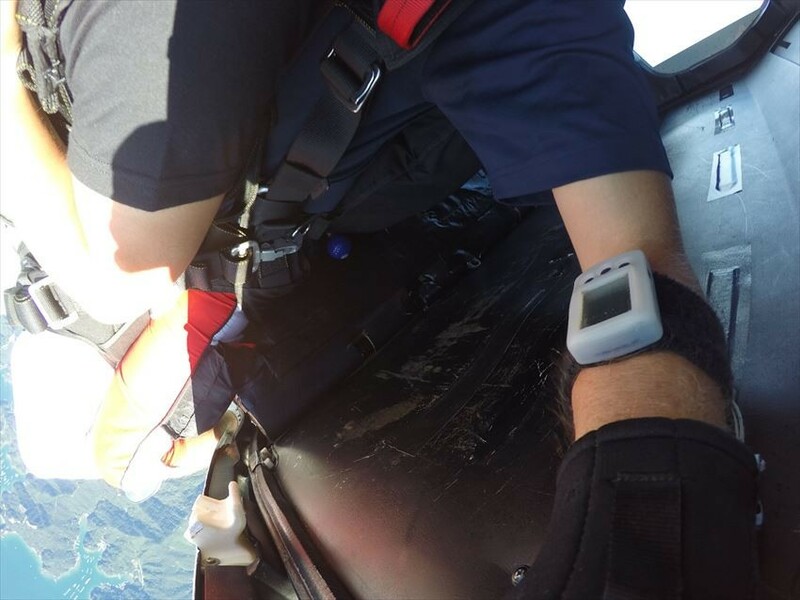 After jump off from the helicopter, it is said that the time of the free fall time is about 30 seconds and the speed is 250 km/hour! 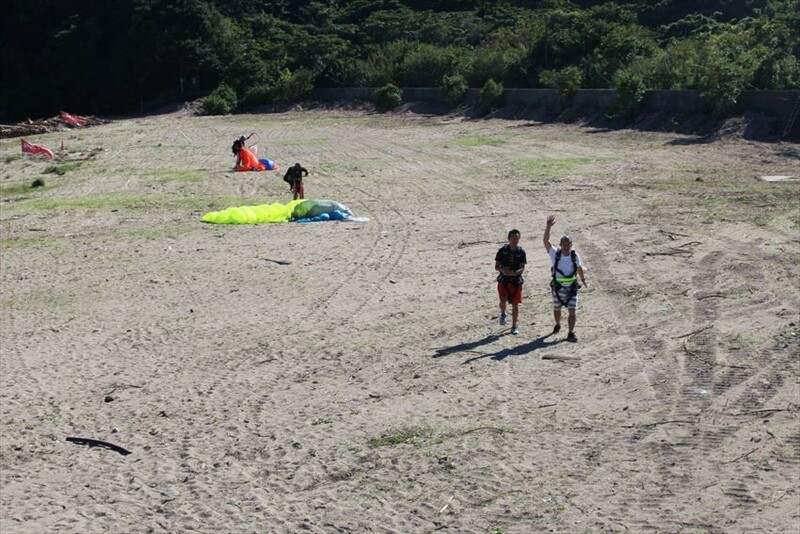 Also, I was told that it will take about 3 to 4 minutes from the timing they open parachute until they reach the coast. Mr. T and Mr. K have safely survived and reached the ground. Their expression were very vivid. ... So, the time has come. My partner is a New Zealander, Rhys. He looks reliable to take care of my life. 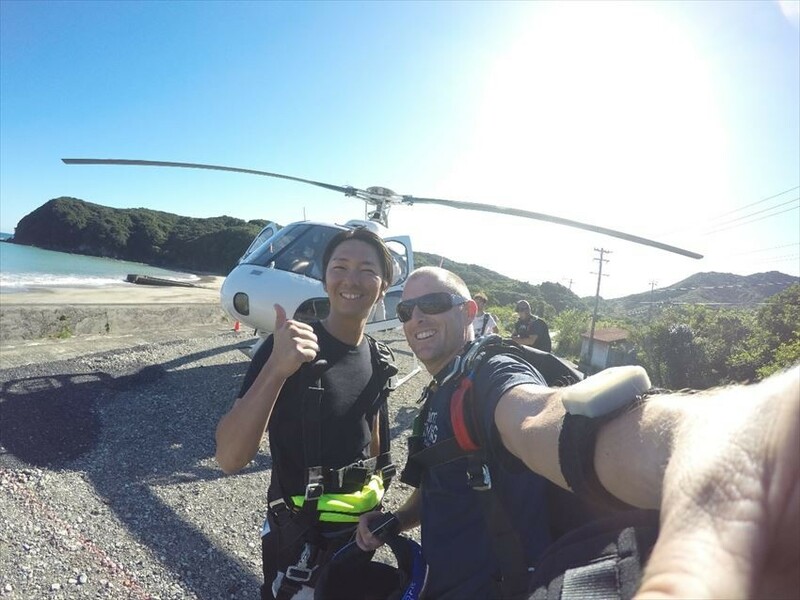 Mr. O who got into the helicopter with me was actually just experienced his skydive for first time in two years ago, and this time was his second time to challenge again. 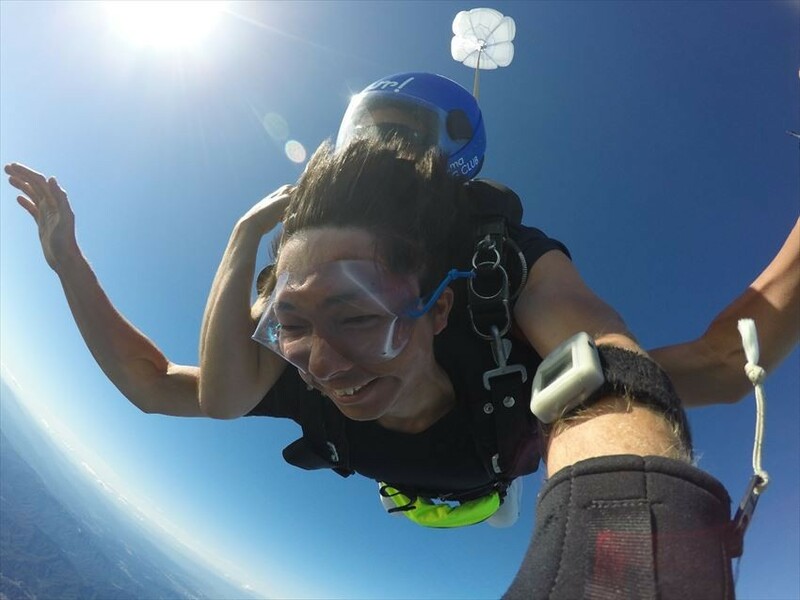 He was really a crazy person who is fascinated by skydiving, and he told me with a smile, "It was a really awesome experience for my first time!". It caused me to look forward to it. We got on the helicopter and took off! The altitude was going up gradually. It was really a blessed weather on that day. Everything of Ise Shima, Rias style coast and sky were so beautiful. We reached to an altitude of 10,000 feet height (3,000 m). Mr. O was the first one to start his journey. I was so excited when it came to my turn to jump off. My body was fully attached parallel to Rhys’s body firmly from neck until head. By doing so, we would be able to handle the air resistance well when flying. I tried to look down. Wow! It is so high! 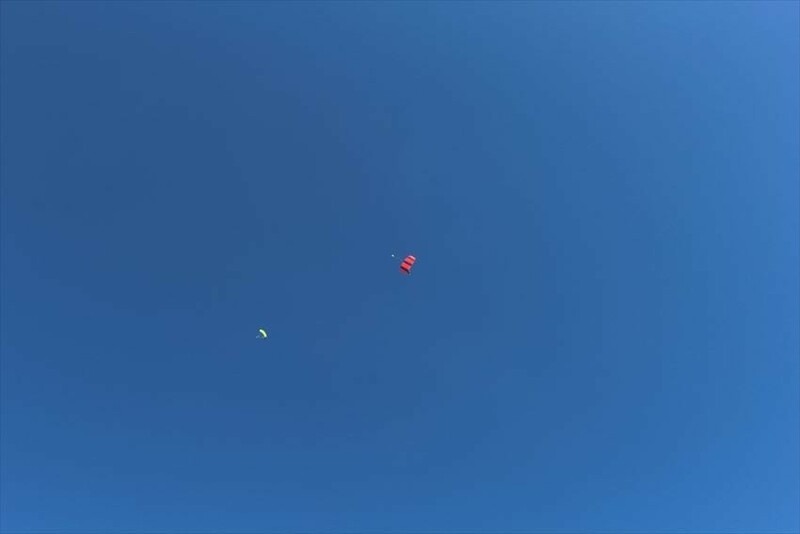 30 seconds of free fall time. The feeling of falling was just like I myself is breaking the air and wind. The scenery in front of me match perfectly with the feeling, and it was such an awesome comfort for me. It was really the best! The parachute opened, and I had a “high five” touch with Rhys! I could feel my body was producing a lot of adrenaline. At this moment I found that Ise Shima is so beautiful to be seen from the sky. Also, at this moment I understood that there are still new thing to be discovered even it is my hometown. Rhys taught me on how to operate the parachute. Pull the right grip downwards to turn the parachute to right direction, and pull the left grip downwards to turn to the left direction. I really enjoyed the air travel very much. We are approaching the coast, and Rhys handled the landing. We stretched our feet to prepare for landing. I have survived safely! At last, let’s posing and take a nice photo with Rhys who take care of me. 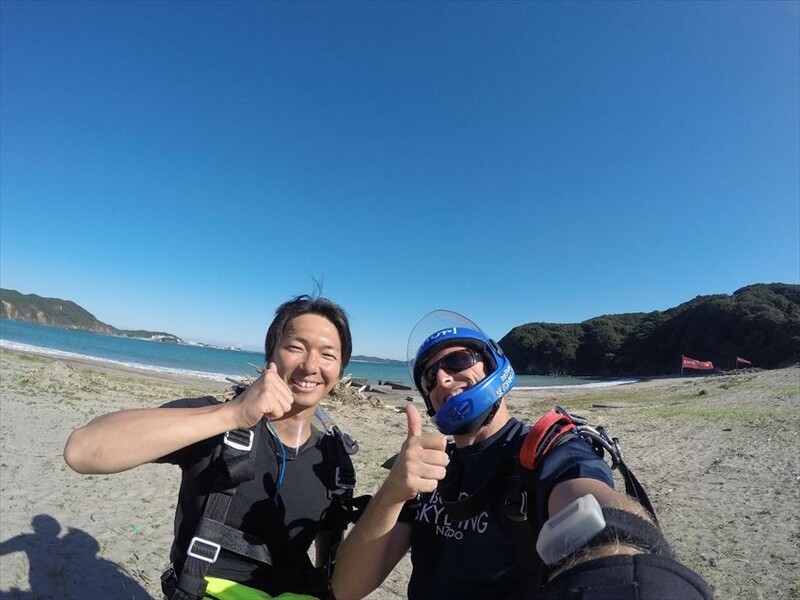 I was really happy to be able to skydive at Ise Shima. 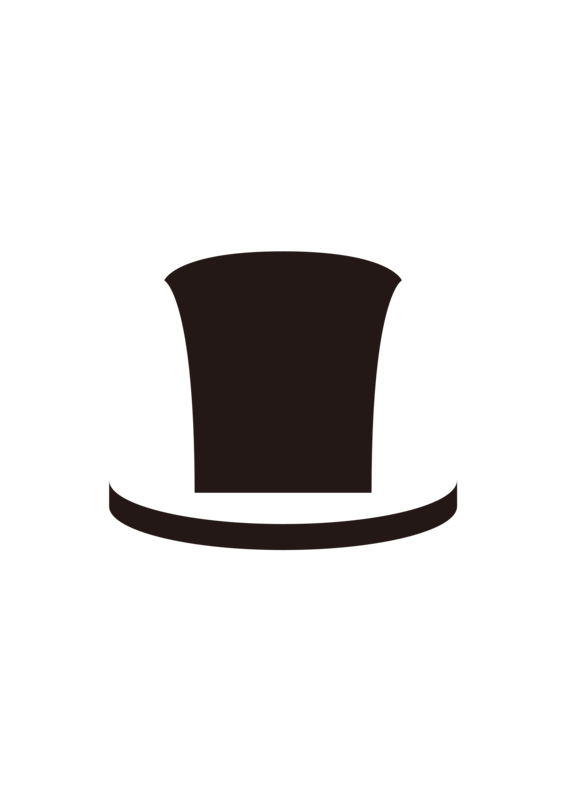 If there is an opportunity I would definitely like to challenge again. The business day of 2018 is on 21st October, while the business day for year 2019 falls on May. It may take time, but I'd like to fly alone someday. I was born in Minami Ise and grow up in Ise. 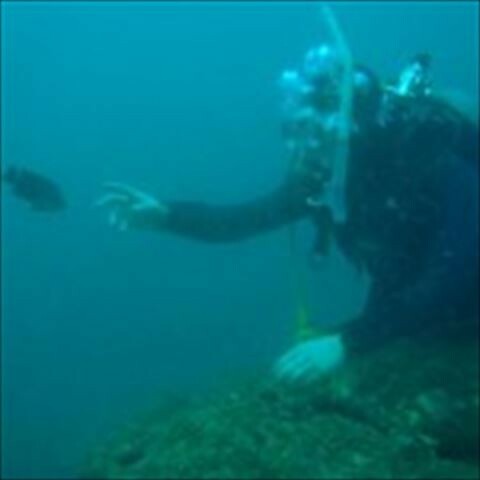 My curiosity to discover the unknown field in Mie prefecture seems to be stronger than any others. Especially experience program is my favorite activity. From day to day I realized that the connection between people is very important. 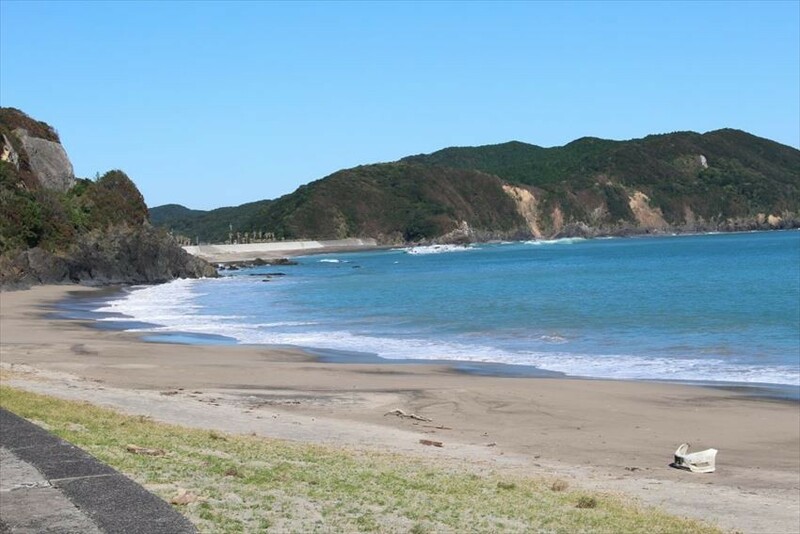 I hope that I could post more article to introduce the plenty of interesting place and also interesting people in Mie prefecture to more people.